The Buffalo Seminary Alumnae Association is committed to expanding communications and networking opportunities for all alumnae. We hope you will share where your life has taken you, what accomplishments and successes you have found along the way and how SEM can reconnect with you. Submit your class note here. Kaitlin Hughes '16 pictured here with Lisa Abeyounis '82 and her sister Arianna '13 at SEM's Alumnae Winter Get-Together at Hydraulic Hearth. See more pictures from the event here. Kathryn graduated from Daemen College with a dual degree of a Bachelor of Science / Master of Science: Physician Assistant Studies. She will be moving to Pittsburgh, PA to work in a surgical residency at the University of Pittsburgh Medical Center. Members of the class of 2008 celebrated Lauren Moloney Ford's wedding to Chad Ford in Charleston, South Carolina on Oct 27, 2017! From left to right: Zoe Friedlander, Emma Papagni, Lauren Moloney, Michele Kujawa and Abi Stark. Members of the class of 2008 celebrated Kyle (Friedman) Harnett's wedding to Justin Harnett in Buffalo on September 16, 2017! From left to right: Betsy Bloom, Kathryn Steffan, Heather Kimmins, Kyle Harnett, Ariane Mallon, Megan Creahan Pellis. In September, Tara married Anders T. Rosén and held what is sure to go down in history as the first Viking-Pakistani wedding... or maybe the first of many! She and her husband were shortly thereafter awarded a fellowship to teach English in Colombia, and will be there from July until November. This July, Tara's husband and she accepted the Atlas Corps Teaching Fellowship, an opportunity to teach English in Colombia. The fellowship is a collaboration between Atlas Corps, Heart for Change, Volunteers Colombia, the Ministry of Education, and el Servicio Nacional de Aprendizaje (SENA). Through this collaboration, the Fellowship's mission is to facilitate the development of a post-peace accord, prosperous Colombia, where children and youth have the opportunity to receive a high-quality bilingual education. Weekly, she teaches about 400 Colombian students along with Colombian co-teachers, and shares with her students different aspects of American and Pakistani culture. I am living in Rochester, NY with my boyfriend, John and our two kitties, Doug and Cozy. We moved here last spring when I got a new job with Nestle Purina. I am a territory manager and I cover Buffalo-Syracuse. I am able to go home often with the job and I still am a member of the BSAA! John and I are loving our life in Rochester and we can't wait to explore more of the area come summertime. Can't wait for my 10-year reunion this summer! I just wrapped up a Fulbright Distinguished Teaching fellowship in the University of Glasgow's theatre department, researching cross-demographic arts education programs. I had the opportunity to work with the National Theatre of Scotland while I was abroad, as well as lecturing at the University of Cambridge, my mother's alma mater. (I was, unfortunately, not able to locate Nessie, despite numerous trips up to the loch.) I'm currently the Executive Director of the National Theatre for Student Artists (www.nationalstudenttheatre.org), a nonprofit organization that brings high school and college students from across the United States together to create new theatrical works off-Broadway. This summer will be our first time holding rehearsals at Daemen College right here in Western New York! I'm currently splitting my time between Western New York and my home in Airdrie, Scotland. If you're ever visiting the United Kingdom, please get in touch! Lacy Ellinwood is celebrating one year as the Library Development Director for the Mississippi Library Commission, the state library agency based in Jackson Mississippi. Lacy has worked for the Mississippi Library Commission for almost 6 years. She was recently featured in the Jackson Free Press for her work at the Library Commission and as a local bass player for her band Kicking. Dr. Lauren McHugh Herr graduated with a doctoral degree in Education Administration and Policy from The George Washington University. Her dissertation is titled, Principals' Interpretation of ELL Policy. She is currently teaching in Alexandria, Virginia. It's been a whirlwind as we have moved several times in the past few years- first from Atlanta, Georgia, to Beijing, China, where we lived for two years, then to a rental house in Bethesda, Maryland (outside DC), and finally to our own house this past fall. I've been married for 15 years and have three girls, ages 9, 11, and 11. I am working as the Chief of Epidemiology and Surveillance at the US Peace Corps headquarters, where I manage a small staff. I was a Peace Corps volunteer in West Africa between 1991-1993 so it's great to be back contributing to the organization that created so many opportunities for me. I'm attaching a photo of my family on a recent trip to Switzerland in front of Lake Geneva. If you're in the greater DC area, please look me up! I am pleased to share that I am still living in the Washington DC area with my husband. I am a professor at the University of Maryland in College Park (UMD) and am enjoying it tremendously. My story and research was featured on the front page of the UMD website (see attachment). Very exciting! I would love to hear from Sem alumni living in the area or elsewhere. I can be reached at jenrob@umd.edu. Liz Markus 85' (Colby-Oishei Spring Artist, 2011) is included in DOMESTIC SEEN, a multimedium exhibition curated by Bruce Hartman at the Nerman Museum of Contemporary Art in Kansas City. The show runs from October 20th, 2016 through March 26th, 2017, so be sure to check it out if you are in the KC city area! Additionally, MTV RE:DEFINE recently produced a short video about Liz as part of their GONE IN 60 SECONDS project. Still living and wandering in Europe. With the kids grown up and living in the US and Nottingham, UK, I took early retirement and moved to France for a year while my husband worked in a French hospital. We're back in Wales and planning our next adventure. I am excited to return to Buffalo to attend our 40th reunion, and hopefully see a lot of old friends. Hi from sunny Las Vegas! After living in Buffalo most of my life I moved to Las Vegas 5 years ago. This spring my husband and I will be starting a new adventure in Pittsburgh, Pennsylvania. I’m still teaching elementary school and loving it. My two boys are living out west, Tommy in Utah and Taylor in California. Looking forward to attending our 40 reunion this summer! Dr. AmyBeth Taublieb (aka - Sweetheart of the Month) just had her third book published. THE TAIL WAGS THE DOG - A PSYCHOLOGIST REVEALS TWO HUNDRED LESSONS LEARNED FROM HER PATIENTS is available from all major retailers (including Amazon.com) as well as from the publisher AuthorHouse.Com. Greetings 76ers! Who can believe that our class will be celebrating 40 years at reunion in June? I've spent great times with Jane Irving Harrington, Jane Lord Dellinger and Susan Kraus Harris this past year and the years have been kind to us all! I'm looking forward to seeing more of us in June! As for myself, I've enjoyed serving SEM on our alumnae board for 8 years. Teaching reading in Buffalo Public Schools continues to give me enormous fulfillment, thank goodness! Finally, my daughters, Tess and Abby, are working to complete their undergraduate degrees from UB and Ithaca College this year - life is good! I send all good wishes out to my classmates and fellow SEM friends! Hello from Susan Coe Brown and Liz Morrison! In June 2017, we took a two-week journey through Scotland. We hiked the Highlands, the Isle of Skye, and the Outer Hebrides. And we also enjoyed time in Edinburgh and Stomoway. This photo was taken on the Quiraing on Skye, a challenging hike with spectacular views. Hoping to see all of you at the next class reunion. Greetings, fellow SEM girls! Just a quick shout out to say how excited I am for our 45th reunion in June 2018. Hope we see many new (old) faces at this year's reunion. 2017 was a tumultuous year for me but ended on a good note with my purchase of my first home (very lucky considering there were 14 offers on the table!). I'm on the still-burgeoning West Side of Buffalo and loving every minute of being in my hometown. What are you up to? Hope to see you in June! Greetings classmates! Thought I would join Lucy in this group forum with life updates. Life is still very busy in the marketing department at Providence College and teaching yoga, but turning 61 has me eyeing retirement and a change in lifestyle. Would love to hear of other's experiences with this. Our daughters are great; Sara married and living in NH and Holly living a bit closer in Newport. David and I enjoying life together and traveling whenever we can. Looking forward to summer! Hello fellow SEM girls! I would love to hear more from you on your life, activities, turning 60, etc! As for me, I'm working at MJ Peterson in the city office and witnessing the crazy-busy real estate market. It's fun to see the growth in our city! I'm still serving on the Buffalo Seminary Alumnae Board and excited about new alumnae developments. Stay tuned for more. What are you up to? I am proud to announce the arrival of my grandson, Ethan Michael Alster, born 3/29/17, to my daughter Katie and her husband Jason. We are beyond delighted to have Ethan in our lives! Hope many of my classmates are sharing in his joy in their own families. I’m enjoying my retirement from National Grid and volunteering way too much at Meals on Wheels of WNY(where Tara Ellis '88 President of the BSAA is the CEO), as a Board member on the BSAA, as an Ombudsman at an Assisted Living Facility in Buffalo and as a member of the Missions of Love Ministry at my church, the New Mt Ararat Temple of Prayer. On March 25 I took a welcome break with Lucy Coburn '73 and enjoyed the sweet jazz sounds of Sharon Bailey '85 with the bandWalterKemp3oh at the Pausa Art House in Allentown. The entertainment was amazing. Also in attendance were Amy Kelly '85 and Caitlyn Crowell '86, a history teacher at Nichols. A fabulous time was had by all. Sharon Bailey at the mic. Dear Class of 1968--Looking forward to 50th reunion in 2018! Haven’t been in Buffalo in many, many years. But great memories of SEM--friends and teachers. Happily retired in Wilmington NC! 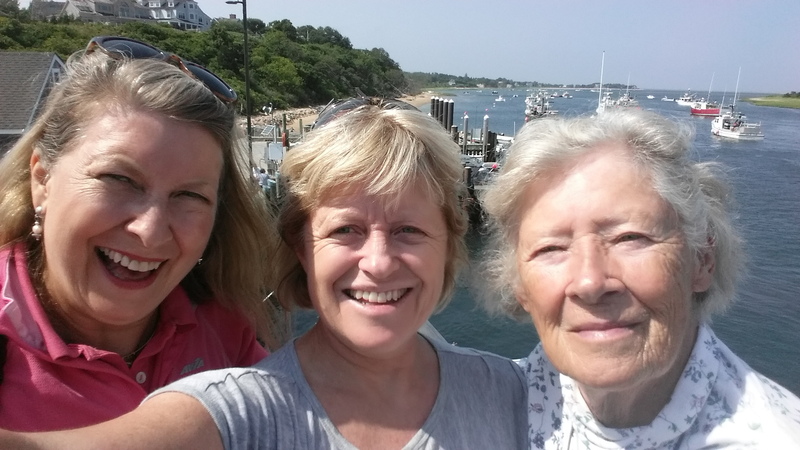 In July, Ann Masotti Hengerer, Betsy Hitchings Hampton and I had a lovely lunch in our beautiful Newport, VT with our own dear Mr. Foster! Mr. Foster (we are to call him Bob now) and Betsy both live here. Ann and her husband Ned were visiting Hank and me in Charlotte, VT up from their home in Maryland. What a nice time we had! LOVED seeing and catching up with our beautiful classmates Pam, Ellen and Peggy for the Friday June 2017 alumnae dinner! That one day in Buffalo remains a wonderful memory, commemorating our shared times, and providing always a much needed reality check on my always unfettered imaginings of the future into which we leading ladies progress with all the benefits of our shared miraculously irreplaceable education. I do still appreciate my education at SEM more and more with each passing year! Friends for 60 years! Pat Waterman, Ruth Greenberger, Corny Roberts, and Bobbi French (all class of '61) spent a week together on the Outer Banks of North Carolina. Enjoyed the beach, local sightseeing, and sharing stories from our lives in Vermont, New Mexico, Colorado, and Washington DC. On March 8, 2017, we sold Frederick House and at 73 and 83, retired. Owning a 23-room small hotel for 34 years was wonderful but being retired is wonderful as well. The Copeland sisters, all SEM graduates, on vacation in Stowe, VT. From left to right: Susie Grant, 1956; Merrily Beyreuther, 1960; Carol Sullivan 1955 and Sally O'Brien 1959. Recently I participated in a large continuing education lecture series in Tucson with Joanne Rich Healy '56 and her husband, Tom. Coincidentally, the Healys moved next door to one of my closest friends - someone I have known for more than 26 years! Retired and enjoying life in our long-time home. No plans to downsize or head south, though sometimes it looks like a good idea. Great to see Mary Hanrahan Berlow in NY several weeks ago, and visit the Munch Exhibit at the Neue Galerie. Wins "Best in Show" of about 100 entries at an art gala in Winnetka, Illinois. "I was thrilled the opening which was a well attended benefit party." Carol wrote. Submitted by Alison Fleischmann. Notice the complementing floral art! My third great-grandchild Nora Louise Piotrowski was born June 10, 2018. Her grandmother, Jennifer Owen Adsit, was class of 1972. All live in Vermont! All are skiers- not surprising! Below is my brief life summary on the occasion of the Class of 1948’s 70th SEM Reunion. I’m sorry that I’m unable to attend and renew old friendships owing to a “bad back” (osteoporosis/scoliosis). Following two years in public high school in North Tonawanda, Jean joined the SEM Class of 1948 in fall 1946 and finished the final two high school years at SEM. Found German language with Miss Mary Jauch and American and European histories under Miss Dorothy Abbott especially interesting and challenging. At the strong recommendation of “Miss Angell,” Jean applied to and was accepted by Mount Holyoke College (MHC) as a member of the Class of 1952. Course “concentrations” at MHC were in the fields of physiology, chemistry, and German language and literature prior to her graduation in 1952. In spring 1952 Jean applied for and received a position as a supporting chemist in the patent field with the former Explosives Department of the DuPont Company. The job was at the Eastern Laboratory (EL) on the grounds of the Repauno Plant in Gibbstown, on the Delaware River in Southern New Jersey. (The EL was the original explosives laboratory of DuPont existing from the mid-19th century till about 1970 when the explosives business was terminated and the lab closed.) Jean’s primary duties included searching of patent resources both locally at EL and at the U.S. Patent Office in support of the work of technical and legal/patent personnel. She also did much translating of technical and legal documents from German into English. While at EL, Jean met and in 1956 married a fellow EL employee and South Jersey native, Joseph Hackett Bostwick (“Joe”). She continued to work at EL while Joe completed his studies in chemistry at Drexel University in Philadelphia while working part-time at EL. Following his graduation, he returned full-time to EL, and in 1962 we built a house in the small town of Wenonah in Southern New Jersey. Jean, from 1965 to 1976, did translations at home of technical and legal documents from German into English on an ad hoc basis for various DuPont departments. During this period, in 1972, we moved from our Wenonah home to the Wilmington, Delaware, area area owing to Joe’s transfer to another DuPont department located in Delaware. Jean, in 1976, applied for and received a position as a patent chemist in the Patent Section of the Law Department of Hercules, Incorporated, in downtown Wilmington. This position, initially similar to the one she held at DuPont, became more complex as up to 13 Hercules patent attorneys were served. In 1983 Jean was made supervisor of the technical support group for the patent attorneys, a position she held till her retirement in 1995. Husband Joe retired from DuPont as a “hydrogen peroxide technical specialist” in 1989. (Counting his work part-time while at Drexel, he had worked for DuPont over 30 years.) As noted, Jean retired from Hercules in 1995. Their retirement years together ended abruptly in January, 2002, with Joe’s sudden death from a heart attack. Primarily in retirement and as a widow, Jean has continued in two areas of activity and service: The Presbyterian Church (USA), both locally and in the wider church organization. Locally, much of the contributions have been on the church governing board or “session” where she served many terms as “clerk of session” (chief lay officer), finally retiring at the close of 2016. She also has served on New Castle Presbytery committees, and in 2004 was a delegate or commissioner from the Presbytery to the national biannual General Assembly meeting of the PC(USA). The board of the civic group serving the people and communities of northern New Castle County, Delaware, outside the City of Wilmington. Talked to Eva Potter Lee on our 90th birthdays on April 8th. We agreed that the "Golden Years" are not that fun. I managed to get myself to Miami to celebrate the big 90 with my "southern grandchildren" and my son. Buffalo has been very cold all winter. Eva and I can't make it to the graduates dinner. How lucky you have Helen as head of school! She is a dear friend of our family. Life goes on very well for me at 94, thanks to our large family's care, being busy with (F)friends at Quaker Meeting. My love to SEM!